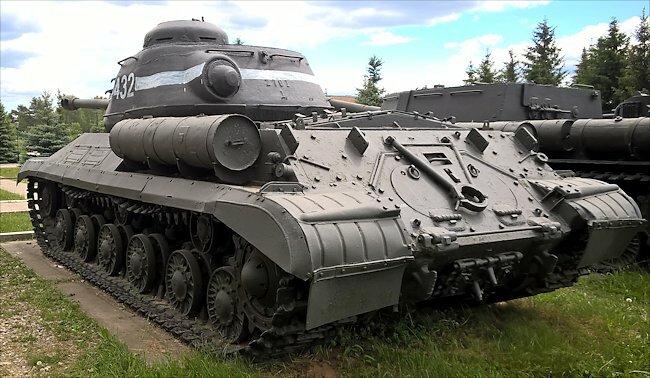 This WW2 Soviet Joseph Stalin IS-2 tank can be found at the in Kubinka Tank Museum near Moscow in Russia. This was the Red Army's answer to the German Tiger Tanks. The third generation of heavy tanks—birth of the Stalin tank. The development of the heavy tank had now reached the stage where its size necessitated more powerful armament than that used on the medium tank, and its speed should be improved. Further, the appearance of new enemy 75 mm and 88 mm self-propelled artillery mountings presented armour which the KV-Is could not penetrate, and a larger gun was required. Expecting Germany to continue the construction of heavy tanks and gun motor carriages, the gun versus armour race began, and the Commissariat for Tank Industry was ordered to undertake a new heavy tank project with increased firepower and immunity. Towards the end of 1943, 21 different prototypes of tanks and self-propelled gun mountings were built, six of which were passed for quantity production (the two experimental KV variants mentioned above being included in the total). Among these was the heavy tank IS losef (Joseph) Stalin, designed by Kotin, which was a thoroughly revised KV-85. This tank had an 85 mm gun in a new cast turret and a modified suspension and engine, and became known as the IS-1 or IS-85. The tank weighed 44 tons and had a similar turret to the KV-85. The transmission in the tank was improved, a two-stage planetry mechanism for turning being introduced. Manoeuvrability was greatly increased and the average speed rose by 25 per cent compared with the old KV. The old KV chassis were reworked into SUs, ARV s and artillery tractors. 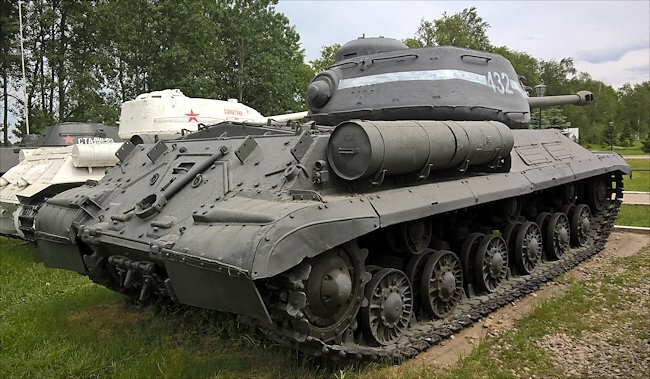 The IS-1 was issued to the Red Army during 1943, but its production was restricted to a small quantity during the period from the end of 1943 to the beginning of 1944. An up-gunned version appeared during late 1943, called IS-100 mounting a new 100 mm tank gun. This tank was also rejected and in mid-1944 the IS-1 tank was given a new turret with a powerful 122 mm gun (adapted from the corps artillery gun), and was designated the IS-122 (not to be confused with the SU-122 Artillery self propelled howitzer). Based on a modified KV chassis, engine and transmission, the IS tank represented a considerable advance from the KV. The driving sprockets, idlers and return rollers were lowered to enable the space between the top of the track and the hull roof to be used for panniers, thereby making possible the provision of a larger turret ring. The hull nose was made in a single casting, and the upper and lower tail plates were made from single plates, each sloped at approximately 45°. Previous tanks of this type had the armour at the front of the driver made of a flat, slanted plate running from side to side, but on this tank a shaped casting was used instead. This casting was faired away on each side of the driver, who was located on the centre-line. The armour casting around the driver sloped upwards as well, so that the frontal portion of the superstructure had a streamlined, rather than box-like form. In consequence, the superstructure did not attain its fullest width until a point approximately opposite the centre of the turret. Soviet designers also parted from original KV tank design by providing a rear hull plate which had acquired the upward and forward slope once peculiar to the T—34 medium tank. This plate incorporated two transmission servicing hatches. The KV suspension was used together with the standard Model V-2 12-cylinder diesel engine. The tank mounted the 122 mm A/T k gun D—25 model 1943, together with a coaxially mounted standard 7-62 mm Degtyarev air-cooled machinegun. The 122 mm gun was a comparatively long one with a German-type double-baffle muzzle-brake. The 122 mm of the Joseph Stalin Tank with semi-fixed ammunition was less easy to handle and yet not as powerful as the 100 mm. A bracket was provided at the hull rear for retaining the gun during travel. Another 7-62 mm machine-gun was ball-mounted in the rear of the turret, and a third was in the bow to the extreme right of the driver. A further machine-gun could be mounted on the turret for anti-aircraft use. The driver was provided with three episcopes; there was another to the right of the main armament, and one in the commander's cupola on the left of the turret. In place of the pair of gunner's periscopes usually fitted to the right and left of the turret on Soviet tanks, there was only one, on the left. A vision slit with pistol port below was found on each side of the turret, and also in the rear. During 1943 102 of the IS-I (IS-122) tanks were produced at the evacuated Kirov plant. This tank was issued to units in late 1943 and appeared in action in early 1944. It was first used in the spring 1944 campaigns which cleared the Germans from the Ukraine and from part of Poland, and later in the drives from the Baltic States. Garrett Underhill wrote, 'The IS tank took over both the heavy-tank break-through role against fortified positions, as well as the over-watching fire and anti-tank missions of the SUs. However the Stalin's were pooled in with divisions where they were needed, and the SU SPGs remained the organic light assault artillery of the mobile divisions—the Tank Corps and the Moto-Mechanized Corps. They were faster, more mobile than the heavier Joseph Stalin Tanks. The Germans felt that the Stalin tank gained 50 per cent increased immunity over the KV through its shape alone. In 1944, Kotin undertook a redesign of the front of the hull of the Stalin tank, resulting in a vehicle with less weight and increased performance. 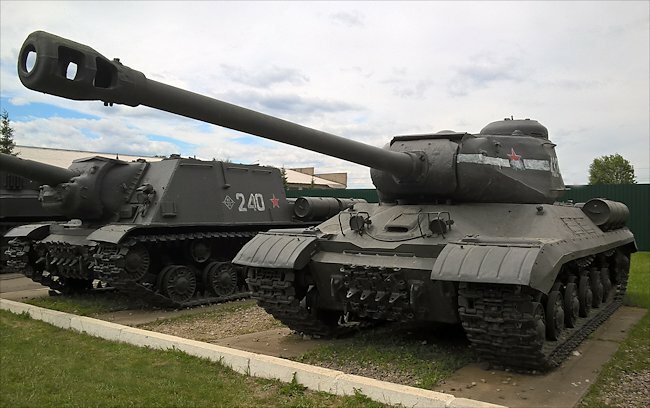 This new model was designated IS-2 (IS—122), and 2,250 of these tanks were produced by the end of 1944. The new model had a modified glacis plate, entailing the replacement of the stepped glacis plate by a flat, sloping type, faired at the sides into the superstructure side plates. This change necessitated a redesign of the driver's vision arrangements. The driver's visor on the IS-1 (IS-122) was replaced by a vision slit and glass block mounted in a bulge on the glacis plate. Otherwise the tank was identical to its predecessor. Mostovenko wrote, 'Employed on the front during 1944, the IS-2 heavy tank quickly won esteem for its high combat reputation. Experience in combat provided a basis for its modernization which was carried out at the end of 1944. The basic alteration was in the amour arrangement. The amour was designed from experience gained during the development of the T-34 medium—allowing the new tank to have large angular inclination, contoured or shaped armoured castings and a new streamlined turret—revolutionary feature of IS-3 the final Soviet heavy tank development of the war.